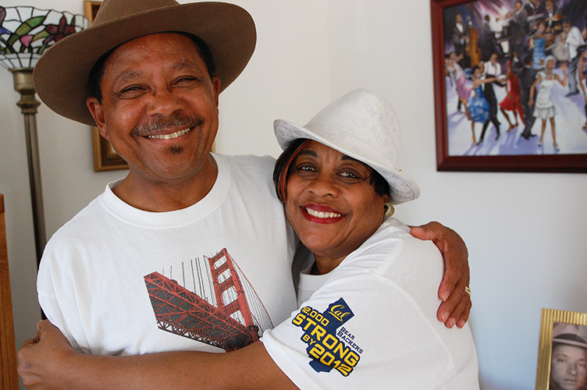 Warren and Peggy Semien in their home in San Francisco. Photo by Barry Yeoman. Like many Creole migrants, Warren Semien made a two-hop migration: first from Lebeau, Louisiana to Port Arthur, Texas, and then to San Francisco, where his grandfather and other relatives lived. He moved into Bayview-Hunters Point, a neighborhood filled with former Louisianans, and found satisfying work with an airline. Later he took a job with the San Francisco Municipal Railway transit system, from which he retired. Arriving in California in 1966, Semien was happy to find a thriving zydeco culture in the Bay Area’s Catholic churches. “The glue was through the church,” he says—it was the primary institution that kept Creoles together. Considering zydeco “sacred,” he has worked to maintain the church-dance tradition in his adopted city. Once or twice a year, Semien organizes a fundraising dance at St. Paul of the Shipwreck Catholic Church in San Francisco. In this outtake, he talks about the racial climate in the Louisiana he left behind and describes his career in California with the airline. AARP Prime Time Radio is the distributor for Zydeco Nation. Fiscal sponsorship is provided by Deep Springs College and the International Documentary Association. This project was made possible with support from Cal Humanities, an independent non-profit partner of the National Endowment for the Humanities. For more information, visit www.calhum.org.